In March 2009 by the initiative of first lady Mehriban Aliyeva and with the support of the Heydar Aliyev Fund the Museum of Modern Art has been opened in Baku. 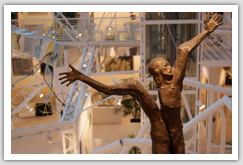 The museum basis - is the collection of the best works of painting and sculpture of Azerbaijan avant-guardists from 2nd half of the 20th century up to now. The collection of paintings and sculptures shows aspirations, strivings and freedom of human soul. The separate hall exhibits classics of the western avant-guard, such as Pablo Picasso, Salvador Dali, and Mark Shagal; as well as classics of Western realism is presented by several pictures from the private collection. Also the collection of Azerbaijan classics of figurative art in this period is presented, they are: Tair Salakhov, Sattar Bakhlulzade, Mikail Abdullayev, Guseyn Aliyev, Tagi Tagiyev, Togrul Narimanbekov, Nadir Abdurraxmanov, Elmira Shaxtaxtinskaya, Nadir Kasimov, Oktay Sadixzadeh and others.